Sample Sale! 50% off and free shipping! Welcome to 2014! It’s time for a sample sale. These quilts have been all over the place (even if just all over the internet) and it’s time for some fresh art to show for the new year. So here’s what I’m offering: 50% off the value on each sample piece plus free shipping. Each piece will be up on my etsy page so it’ll be first come, first served. Here’s what I have to offer!. 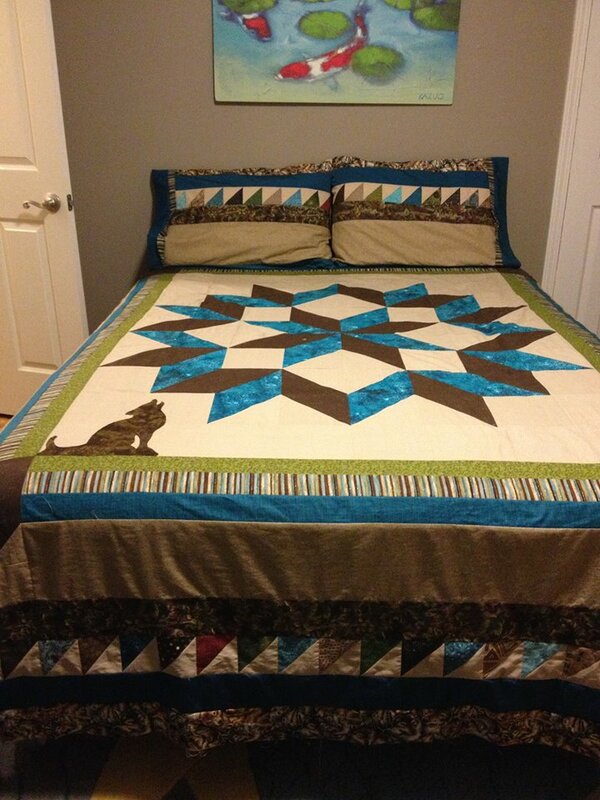 Also, my prices on custom quilts are increasing on February 1st so now’s a great time to get new orders in. First up is, “Big Megan.” Not because I’m big, but because the next one is little Megan. I like these words better than child and young adult. 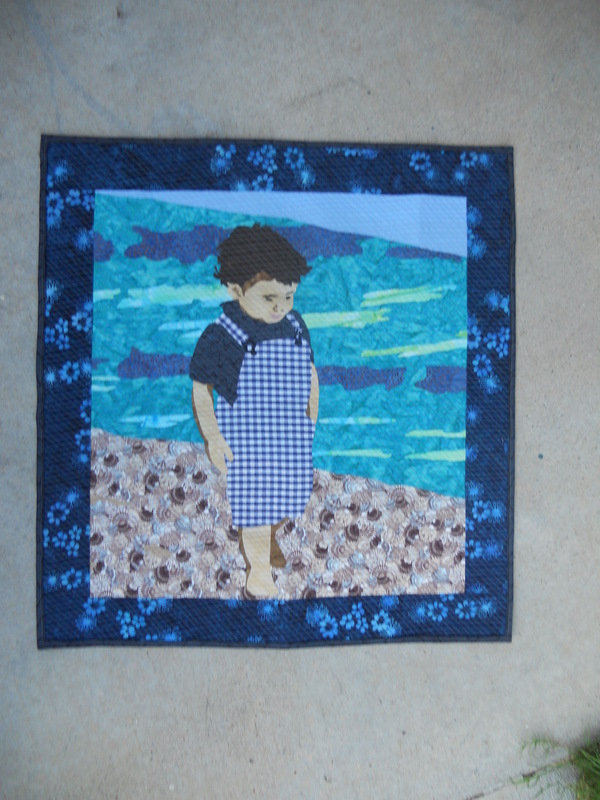 This piece is quilted and measures 13″ x 15.5″ and is valued at $85.45. Which means it’s now on sale for $42.73. Buy it here. 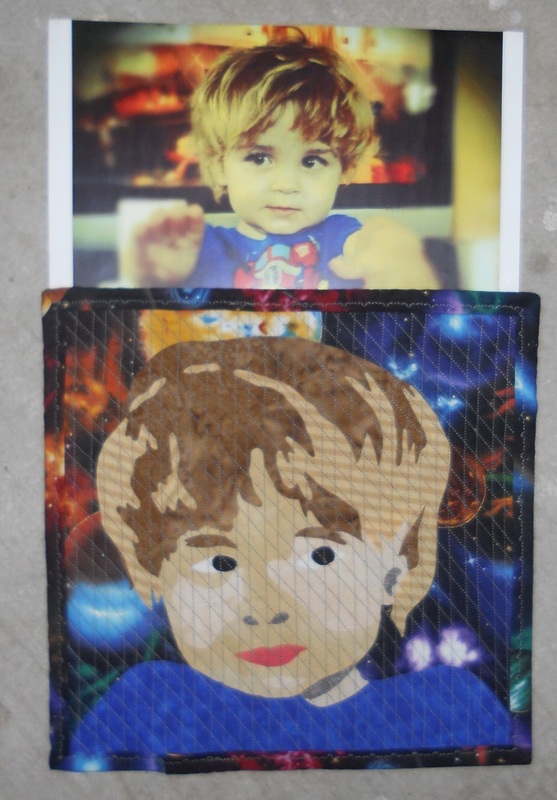 Next is, “Little Megan.” This one is quilted and measures 10.5″ x 13.5″ which brings the value to $67.53. It’s on sale for $33.76. Buy it here. I’m going to break some hearts now. “Denver on the Beach” has already been sold. Here it is to admire anyway. It has a happy home now and has by far gotten the most Oooo’s and Wow’s. “Uncle Time” features my baby sister. You know, before she had a baby of her own. This one’s a 10″ x 8″ top with two subjects in a frame. I’m adding $3 for the frame, so that brings the value to $65. Sale price is $32.50. Buy it here. 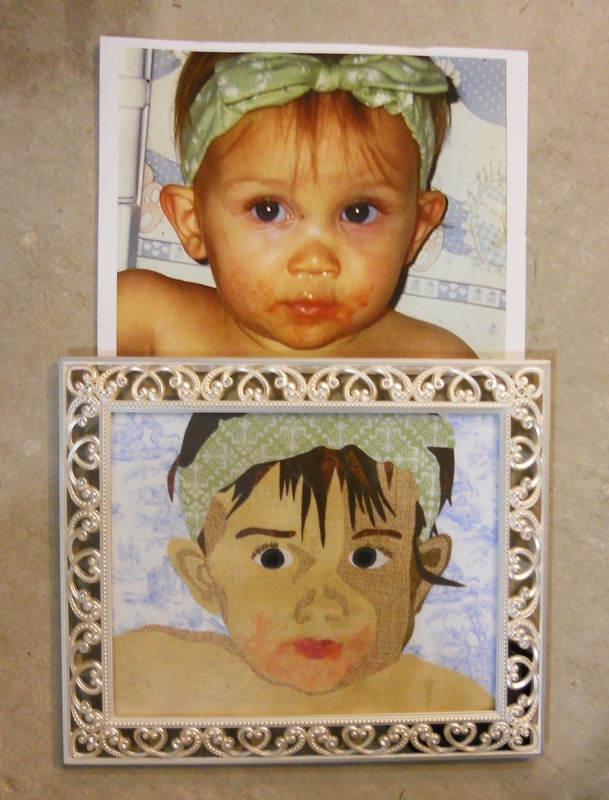 “Baby Food” is another 10″ x 8″ top in a frame. This frame is sparkly and heavy. Since I’m paying for shipping, let’s add $8 for the pretty frame. Total value $45. Sale price is $22.50. Buy it here. “Superhero” is 11.5″ x 11.5″ square. It’s a quilted piece and is valued at $64.66. Sale price is $32.33. Buy it here. Expect previews of this year’s sample pieces in my next post. I’m hard at work making beautiful and unique treasures. Thank you in advance to the photographers and subjects that are letting me use their photographs as inspiration. 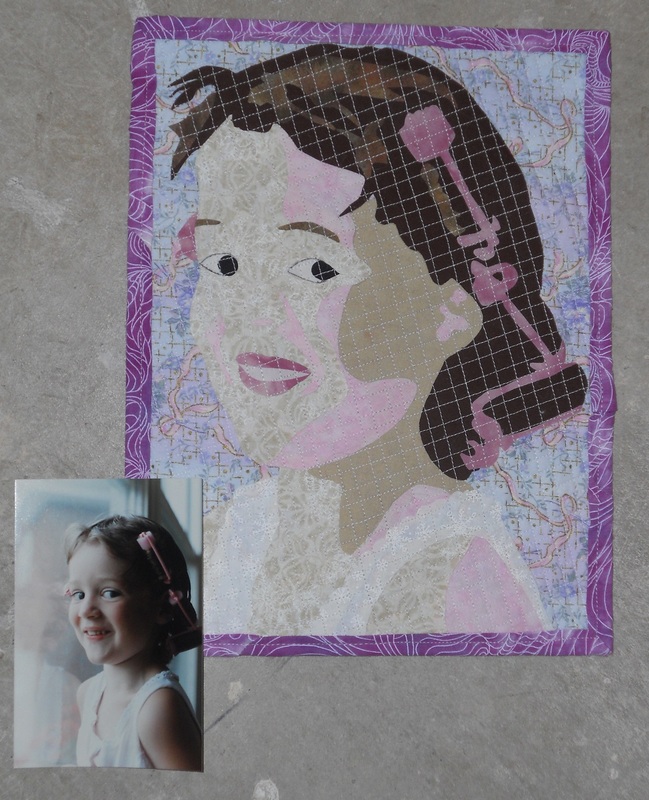 This entry was posted in Art, Artist's Studio, Custom Work, Portrait Art Quilts and tagged 2013, 2014, art quilt, coming soon, craft booth, etsy, Family, fiber art, free shipping, friends, half off, modern quilts, photograph inspiration, portraits, quilt, quilted, quilting, quilts, sale, sample sale, self, sister, tops, uncle on January 7, 2014 by quiltartbymegan. Turtles, Turkeys, Wolves and Bears Oh My! I love collaborative projects. They’re always such an adventure. This one is for the lodge at my childhood summer sleep-away camp, Crystal Lake Camps. I have such awesome memories of this place and the people I met there. So when the idea was pitched on the alumni Facebook page to make clan animal themed quilts for four rooms I was eager to help. There many ways campers are grouped together at CLC. One is by age, which determines your cabin assignment. Another is girls’ camp and boys’ camp. Also your skill level in classes like swimming and horseback riding. Clans are something different and special. Boys, girls, and counselors of all ages are split into four groups: turtles, turkeys, wolves and bears. These clan groups compete in events like blueberry picking and tug-of-war, make their own cheers, and sit together at council fire. It’s another opportunity for bonding and though I haven’t been to camp since 2001 I’m still a proud turtle. So here’s what we’ve done so far for these four clans… starting with the turtles ’cause, well… I’m a turtle. 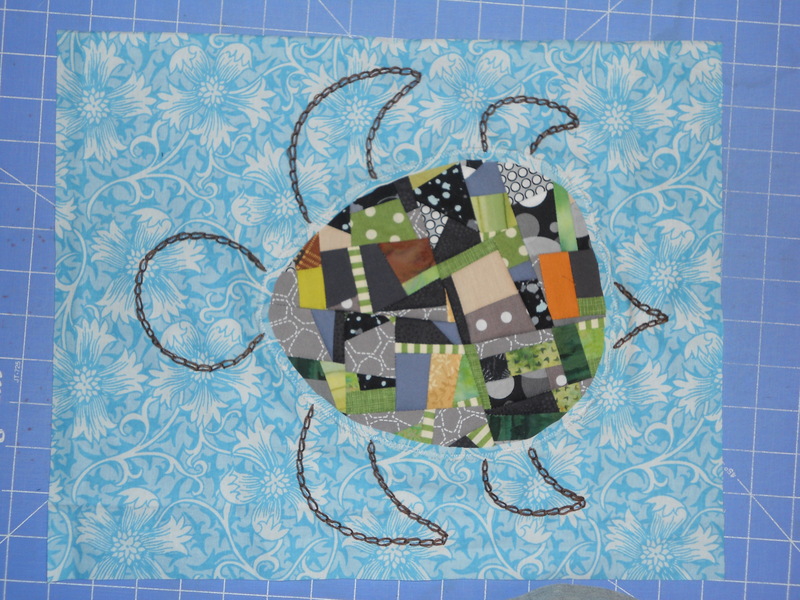 I’m collecting blocks that have a light blue background and one or more turtles on them. The blocks’ measurements must be divisible by 3, so they’re not the same size but I can puzzle them all together. So with seam allowances, you can have 3.5″ x 3.5″ all the way up to 15.5″ by 15.5″ and anything in-between. Here are some of the blocks that have been made. I’m the maker behind this one. Can you tell? Its shell is crumb-pieced then reverse appliqued under the blue fabric and the rest is hand-embroidered. Okay. Onto the turkeys quilts. This lodge room gets two because it has a set of twin beds. I’m also coordinating this project. I sent off some quilt blocks to the alumni reunion weekend along with fabric markers. I haven’t gotten them back yet but am so excited to see what everybody wrote/drew on them for the turkeys quilt! I’m kind of hoping I get a hand print turkey or two back. Do you remember making those in elementary school for Thanksgiving? 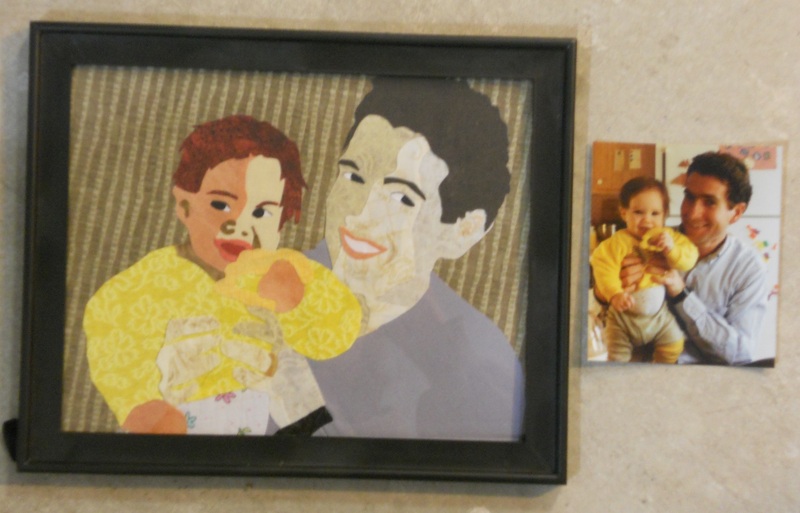 Anyway, alumni weekend was populated with several generations of alumni and their children so I’m sure the quilts will be awesome. Here’s what some of the blocks looked like before decorations. The next two quilt tops are for the wolves and bears. Their very talented maker Betsy Huffman gave me permission to share them with you guys. 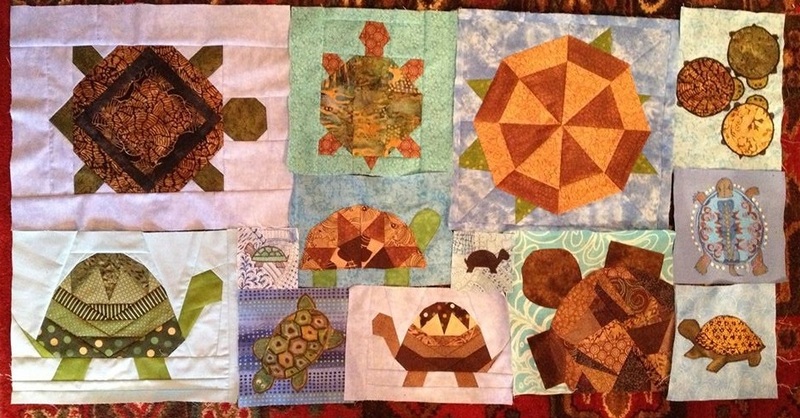 Another volunteer will quilt and finish them. So all four quilts are technically still UFOs (unfinished objects)…. with a lot of love put into them. See? 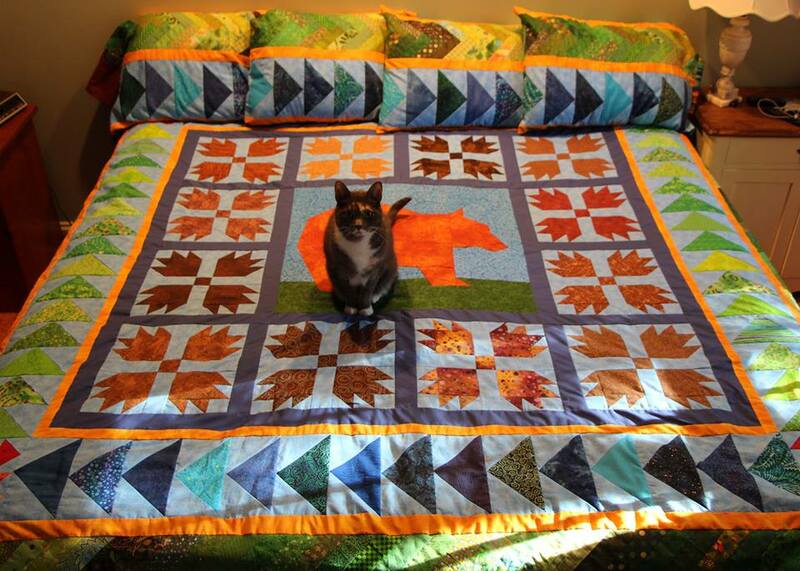 Yes, that bear quilt has a cat on it. My cats are also quilt-inspectors. 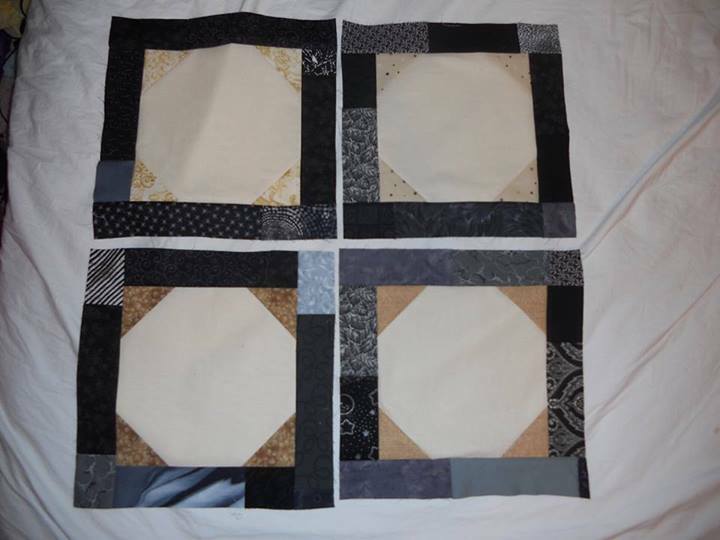 I love how Betsy included the traditional “bear paw” block as one of her borders. I love the howling wolf in the corner of this quilt. Did you notice that Betsy also made matching pillowcases? She said she made them with the leftovers from making these quilts. What a good idea. This entry was posted in Applique, Art, Artist's Studio, Collaborations, Crumb Quilting, Inspiration, Quilting the Quilt, UFOs and tagged artist, bears, Betsy Huffman, blueberries, camp, campers, children, church, clans, clc, collaborations, counselors, group quilts, hand prints, inspiration, lodge, organizing, puzzling, quilt, quilting, quilts, sew, signature quilts, summer camp, thanksgiving, theme rooms, tops, turkeys, turtles, wolves on November 5, 2013 by quiltartbymegan.